If you want to add a special charm to your outfits, then pay your attention to kitten heel boots. I’m sure you’ll fall in love with these amazing and so feminine boots that will be ideal for casual, office or party outfits. You can easily combine them with various pieces of clothes and accessories from minimalistic and classic to trendy and fancy ones. Choose your favorite color and length (ankle, mid-calf or high) for your new boots. To get inspired let’s look below. If you love a simplicity in clothes, then repeat a total black look combining a black sweater, pants, ankle boots and a cap together. To make casual outfits you can mix a classic blue button down shirt, white straight pants, gray ankle boots, a gray mini coat and a brown suede bag. If you have a camel trench coat (maxi or midi one), then you can boldly pair it with skinny jeans, black embellished kitten heel boots, a white sweater and a camel leather square bag. If you’re a big fan of plaid print, then repeat an outfit with a red and black plaid button down shirt, high-waisted cuffed jeans, white leather kitten heel boots and a black tote. 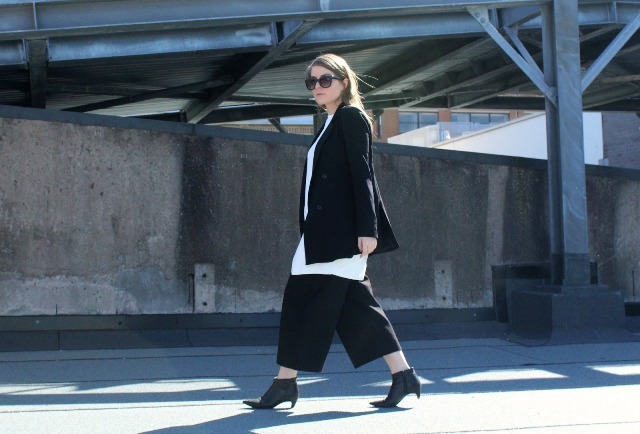 Besides jeans and straight trousers, kitten heel boots look great with culottes, so just mix black culottes, a white oversized shirt, a black blazer and ankle boots. Looking for cozy fall outfit ideas? Then pair a beige oversized sweater dress, a chain strap mini bag and black suede over the knee boots. Or you can put on a black sweater, a light brown corduroy wrap midi skirt, dark brown ankle boots and a yellow clutch. If you wanna create an eye-catching look, then combine a pleated maxi skirt, a gray oversized turtleneck, red suede mid-calf boots and a gray leopard printed maxi coat.